We will learn step-by-step with the help of examples to find highest common factor of two numbers by using division method. 1. Find highest common factor (H.C.F) of 180 and 270 by using division method. Step I: Here we need to divide 270 by 180. [Divide the larger number by the smaller one]. Step II: The first divisor is 180 and the remainder is 90, so we need to divide 180 by 90. [Divide the first divisor by the first remainder]. Step III: The remainder becomes 0. Step IV: Therefore, highest common factor = 90. [The last divisor is the required highest common factor (H.C.F) of the given numbers]. 2. Find highest common factor (H.C.F) of 852 and 1065 by using division method. Step I: Here we need to divide 1065 by 852. 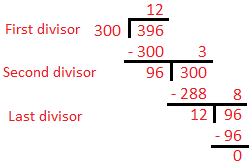 Step II: The first divisor is 852 and the remainder is 213, so we need to divide 852 by 213. Step IV: Therefore, highest common factor = 213. 3. Find the H.C.F. of 300 and 396 by long division method. The long division method is used to find the H.C.F. of large numbers.